Nice location,away from busy touristic area, but in walking distance to the historic city center, where you will find a lots of restaurants, bars and street entertainment. On entering the apartment there's a beautiful stone wall feature with statue, green tree and white pebble's. 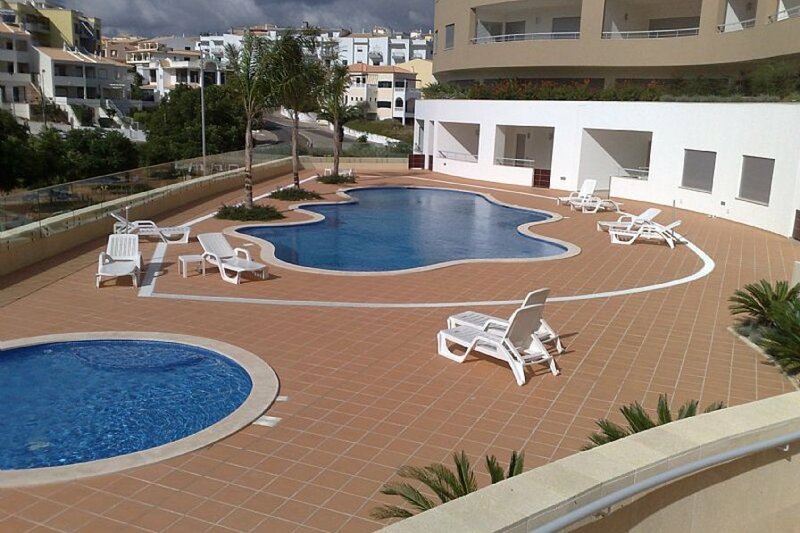 The apartment is fully air conditioned, with heating for winter rentals. For peace of mind there is a video entry system.The master bedroom has a double bed, TV-DVD combined, built-in wardrobes, dresser and mirror, bedside tables and lamps, along with a large en-suite. The second bedroom has twin beds, built-in wardrobes, and bedside table with lamp. Parking: There is a secure underground parking space. Car hire is recommended to get the most out of the area, special if you would like to explore the west side of ALGARVE where you will find unspoiled little coves and surfers paradise beaches. However there is a bus stop right outside the apartment if you preferred to use public transport. This spacious apartment has 2 bedrooms, 2 bathrooms, central vacuum, a very large balcony and an open plan fully equipped kitchen/living area. The living area has a 42? flat-screen plasma with satellite TV, TV unit,and DVD player. It also has an L-shaped black leather sofa. A large glass table with chairs adjoining the living/dining area to the kitchen.We also have a Vodafone dongle for internet connection which can be easily topped up while you are there. The apartment is fully air conditioned, with heating for winter rentals. For peace of mind there is a video entry system. Tennis Courts are very close 5 minutes walk.